Delay and echo is as synonymous with David Gilmour, as his Black Strat and Hiwatts. Itâ€™s the one effect that really defines his tone and sound and if you can only have one pedal, it should probably be a delay. 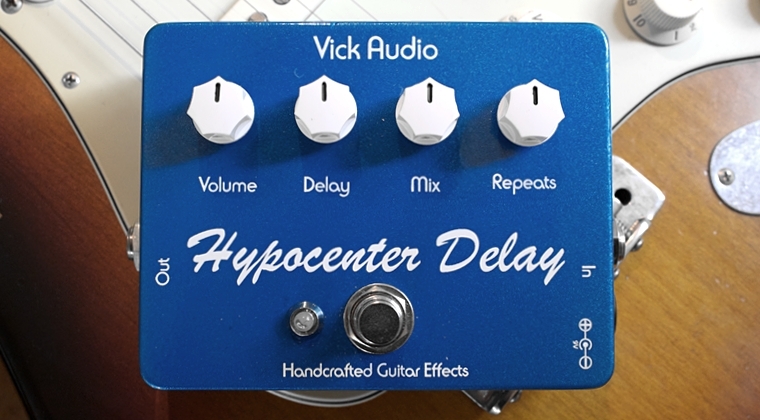 Vick Audioâ€™s most recent creation is the Hypocenter Delay. Hereâ€™s my review. Vick Audio should be known to most of you. Theyâ€™ve created some of my favourite effects over the last few years, including the â€™73 Ramâ€™s Head, Overdriver and the Tree of Life. The latter is my go-to overdrive over any. What Iâ€™ve always liked about Mikeâ€™s pedals is the simplicity and no-frills attitude. Most of the pedals are based on well known classics, with a few welcomed improvements and everything is done with a great knowledge and understanding of tone. The Hypocenter Delay follows in that same tradition and philosophy. It is digital, based on the PT2399 chip, but it sounds convincingly analog, with dark musical repeats and a very low noise distortion. The pedal is housed in a T-Rex-ish chassis, with controls for volume, delay, mix and repeats. The volume controls both the input gain and delay volume. The delay controls the time, ranging from 25ms to 450ms. Not the longest delays but enough to cover anything from slap-back to classic tape and analog echo. The lowest settings also creates a nice doubling effect, similar to some of the new double tracker pedals that have emerged lately. The mix controls the blend between dry and wet signal and the repeats control, controls the number of repeats from a single repeat to fairly moderate self-oscillation. The Hypocenter Delay runs on 9V Boss-style adapter and feature true bypass switching. I must admit that I havenâ€™t been too keen on analog delays up until recently. I preferred those pristine repeats and the accuracy you get with digital. But, over the last couple of albums that Iâ€™ve recorded, I tend to use echo and analog voiced delays more and more. Of course it depends on how youâ€™ll be using delays, but in many cases, I find analog and those dark reverb-like repeats to be more musical and they blend better with a distorted guitar signal. The Hypocenter has quite dark repeats, similar to the MXR Carbon Copy, and some might find this to be just a bit too dark, but compared to the Carbon and similar pedals, the Hypocenter seems to have more space or room. The repeats creates a nice and lush atmosphere, reminiscent of the Binson. What I also like about it, is the fact that you can use the volume control to boost the overall signal into the amp and really crank everything for some wild ethereal echo sounds. In fact, when I did this review, I got such a cool tone doing that and I used it to record a solo for a project that Iâ€™m working on. I would have loved to have some modulation built in. Itâ€™s not a huge draw back but I think analog echo, or the simulation of it, often sound more natural when you can add just a hint of warble or flutter. The Hypocenter Delay is a beautiful sounding echo pedal capable of reproducing those classic tones of the 70s Gilmour, including the reverb-like soundscapes of the Binson. For a modest $139, this should be a great alternative for most budgets. Check out vickaudio.com for more. Excellent sounding pedal, if I ever get a chance I may get one just to take advantage of the extremely inexpensive price. I have been having ohone issues, and am wondering if you have just been busy, but I haven’t seen any new posts in over a week, and only 7 comments have been posted since the 14th. Is everyrhing okay, are you just busy, or is my phone not updating? If I don’t see any new posts within a few days, I guess I’ll be looking into my phone? & sitting on the shelf – though not from any lack of tonal appeal – a Catalinbread Belle Epoch (Maestro Echoplex 3 simulation pedal) & Catalinbread Echorec. Has anyone here compared the newish Dunlop Echoplex Delay pedal (either with or without the Dunlop Echoplex Preamp pedal) & compared it with the Catalinbread Belle Epoch or the preloaded Echoplex setting on the TC Alter Ego V2? I have four Chase Tone Secret Preamp (Maestro Echoplex 3 preamp part for part clone, sounds deeply tone enhancing on the brighter setting) pedals for an “always on” tone enhancer toward the end of the various boards’ signal paths (or at least inbetween going from the last mono to the first stereo out pedal). Considering a Dunlop Echoplex Delay pedal (without the Dunlop Echoplex Preamp pedal) to pair with the Chase Tone Secret Preamp to use instead of the TC Alter Ego V2 on the portable recording board due to its more specialised Maestro Echoplex tone variations & its external tap tempo footswitch (as contrasted with the Alter Ego’s strum tempo feature). Mulling over the merits of losing the Alter Ego V2’s quarter note/dotted eighth/quarter note + dotted eighth switch & versatile tones to gain a dedicated tap tempo footswitch & more tweakable tape age tones on the Dunlop unit. Also: Anyone have two or three of these (Dunlop Echoplex Delay, Catalinbread Belle Epoch, TC Alter Ego V2) & kept two or three for different reasons. If so, what influenced your decision – or the decision to jettison any of them? I have now been unemployed for 6 months, and cannot return to the type of work I’ve done since high school, and only know it, and music. My plan was to work until spring of 2017 and open a small recording studio, but getting laid off changed that plan. I have now pawned my Rodriguez, my Pete Townshend anniverary SG and my Reeves to pay for my medications, and living expenses. I did this as a temporary last resort, but now that I have to have this surgery,I will not be able to even pay the interest to keep from losing my dear Cymbaline, or my Reeves, which is in mint, not a single ding condition. I’m as sad as I’ve ever been, and don’t have a clue how I’ll live through the minimum 3 month recovery, but I’m not giving up yet. I’m not looking for pity, just need to share this to keep it fresh in my mind. I applied for disability based on having broken my back 3 times, and several surgeries to fuse my spine, several illnesses, and a twice fractured neck, but was turned down? I’m in the process of appealing, should be approved the second time, and if approved will get a lump sum payment that would get everything back but it won’t happen in time to save my gear. That’s it, like I said I don’t know how this can help, but I felt like I needed to let it out. Really nice review as always! The Hypocenter sounds really good and natural. I use both digital and analog/tape echoes or delays in my rig, but just as you I tend to use classic tape delays more often than the digital ones, maybe because they sound more musical. I recently bought the Strymon Timeline, as I lacked a way to accurately set delay times on my TC Electronic Flashback and I was finally a bit disappointed by the Toneprint editor (I wasn’t able to properly set delay times or other parameters). I mainly use my Timeline in Tape echo mode, with a bit of modulation and age simulation, and I must say that it is similar to what I’m hearing on your clip of the Hypocenter. I only have the 73 Ram’s Head, but I have to say that I really love Vick Audio effects, moreover they’re very affordable. My only issue with these pedals is that the power supply is on the right side of the pedal, so it sometimes obstruct when stacking the pedals on the board. 1) Where do you usually place mid-boosted overdrive pedals (like the Tree of Life), in front of your distortions/Muff pedals or behind? Personally I experienced better results by placing them in front, but I would like to have your thoughts on it. 1) I never use them with Muffs, so while they’re placed after, it really doesn’t matter. I think Muffs sound better with more transparent boosters, which retains the tone. Too much mids and compression, can make the Muffs sound choked and too dark. 2) My Cry Baby is all stock. I had a V847 at some point and managed to do the effect. What pickups are you using? Are there any buffers next to the wah? 3) I haven’t really talked much about recording. A topic I’ll start to cover soon. The 847 does the seagull effect, but thr 847 A does not, at least that has been my experience. However when I first got my 847 I had to change from a. 022 cap to a .047 to get the oscillating sound. Thanks for the tips, I’ll take a look at mods for my 847-A. Thank you for your time and all your technical advices! :) I think I’ll keep my 847-A, because it looks better than the GCB95c (imho), and look for a mod or even just replace the original cap for a .047Âµf if it is enough to make it laugh. I would also like to install a switch in order to reverse the wah without having to unplug/re-plug cables when I would like to use the wah in a traditional way. Sorry for the late reply and thanks for your tips. I have a Boss CS-2 in my rig, it was placed 1 or 2 pedals away from the V847-A. As I assume there’s a buffered bypass in the Boss compressor, I tried again with only the Wah between guitar and amp. The result was the same, and whatever pickups I use. I usually play with D.Allen Echoes set, but I also tried with EMG pickups, Standard Stratocaster pickups and even Telecaster pickups, without any success. I just noticed a very little self-oscillation effect with the bridge PU of my Telecaster, but really not as pronounced as it should be for the seagull screams. Caps are a big part of the effect, different ways will take different caps to getting the oscillating effect. My custom Castledine that Stuff added a reverse switch, and fuzz friendly circuit to won’t laugh without a .1 cap, and as I mentioned in my post above, my 847 wouldn’t “Laugh” until I sent from .022 to .047, then it worked perfect. I’ve spent a huge amount of time, and money with 5 different ways, to achieve it just right. So every time I hear people talk about how delay defines David’s tone, I always draw a blank as to why. I mean, there are some standouts for me, like “Time”, some of the stuff from “The Wall”, and some of the older stuff, but other than that I can’t honestly think of that many songs where the delay is a really noticeable effect. Am I missing something? Maybe his delay just seems “normal” to me, haha! Wel,, you raise a good point and it’s hard to explain just what I mean. I think delay is perhaps the most important effect for replicating David’s tones just as much as you wouldn’t do The Edge without it. His tones are often entirely based on different delay patterns, while David’s are much more subtle. You have the Another Brick, Run Like Hell etc stuff but 99% of his tones have delay, which is what is creating that slight etheral sound, with the long sustain. It is really a long topic, which I will get to, but Dvaid has always been, and still is, a master at using delay and blending that into his tone. Sometimes it’s easy to spot. Other times very hard but it’s always there and that’s very much the magic of his tones. He’s never using reverb, which can fool many. It’s all delays and while he used the Binson in the old days to create space and room, he’s now using multiple delays to create some of the same effects. Some set up for time tap. Other just to create that space and sustain. I see what you’re saying, and I agree. It’s more of a “complete picture” kind of thing than a “standout effect” kind of thing. nice review, thanks again, is it ideal to have 2 delay in one pedalboard ? one analog and one digital ? I’m thinking about getting DD500 or a cheap NOva delay, now with the analog, what do you think this Vick delay vs TRex Replica or Strymon El Capistan? For authentic Gilmour tones, I think you should have at least one digital and one analog or, a multi unit that does both. It gives your classic tones a bit more of that vintage flavour and the digital unit allows you to dial in the more accurate settings. The Nova can do both very convincingly as can the Flashback. The Replica and Hypocenter are somewhat similar, while the Capistan has a wide range of additional features for more elaborate sounds. Great tone, as always! Thanks a lot!